According to the EyeWeekly.com blog, a-ha will be playing at the Massey Hall in Toronto, Canada on May 11th. Ticket info for the show is said to be “available shortly”. a-ha have played at the Massey Hall once before, on October 16th 1986. Posted in a-ha Tags: a-ha, toronto Comments Off on Concert in Canada? 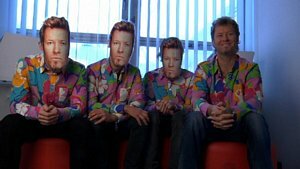 The Newcastle news site Chronicle Live has a small interview with Magne today, in connection with the UK tour in November. The article states that the gig at Metro Radio Arena on November 16th will be the “first and last” a-ha concert in Newcastle. But they have actually played in the city twice before, in 1986 and 1991. “What would be the ultimate a-ha show? Something for everyone. 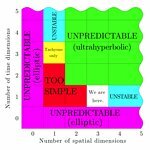 We’re trying to make things representative of our career, while trying to do something that is not completely predictable. I want people to walk away thinking it was the best a-ha show“, Magne says about the upcoming farewell tour. This will be the biggest UK tour since the East Of The Sun tour in 1991. Tickets for all ten dates go on sale Friday, February 26 at 9 am GMT through Gigs & Tours, or by telephone at 0871 2200 260, a-ha.com says. Update from a-ha.com: There will be a ticket pre-sale for all UK shows via Gigs & Tours on Thursday, February 25 at 9:00. This year’s Statoil talent grant was given to the Norwegian singer/songwriter Ingrid Olava at the by:Larm festival/conference tonight. Magne has been the jury leader as usual and appeared at the Folk Restaurant in Oslo to reveal the winner, who will receive 800.000 kroner earmarked for international promotion. “The jury has been unanimous in its decision, and we have put emphasis on her noticeable artistic development. She is a solid live artist who has shown a certain unpredictability and madness in her performances“, Magne said about Olava. This is the third year that Magne has led the Statoil talent grant jury. The two former winners were Ida Maria in 2008 and Mathias Eick in 2009. 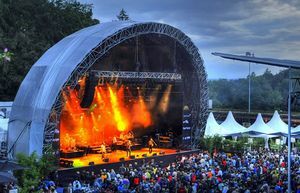 In other news, the festival concert in Zurich, Switzerland on 17 July has now been confirmed by a-ha.com. Tickets go on sale at starticket.ch on 25 February. Magne was in Edinburgh, Scotland on Wednesday to talk about his Alpha Beta exhibition, which is currently on display at the Edinburgh Printmakers gallery. “Right now I’ve come off a couple of exhibitions in Scandinavia and I’m also working on a book of my artworks that will be published later this year. 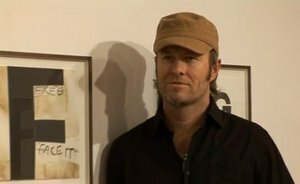 And between [I’m] doing rehearsals for the final a-ha tour, which is due to start in the beginning of March“. He also recalls working as an assistant at the Henie-Onstad Art Centre as a teenager, where he had the chance to meet artists like David Hockney and Yoko Ono. There is also another short video clip from Edinburgh here. On Thursday Magne was back in Oslo to attend the annual by:Larm music festival/conference, where Dagbladet observed him enjoying a concert by the Danish band Oh No Ono. 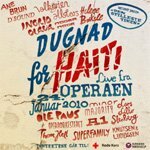 A collection of live songs from the January 24th fundraising concert for Haiti is released in Norway tomorrow. 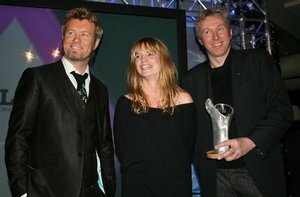 Unfortunately, Morten’s performance of “O Bli Hos Meg” is not among the tracks that are on the CD. However, both the studio and live version of “Den Stilleste Timen”, which feature Morten on vocals, are included on the CD. Speaking of “Den Stilleste Timen” – the music video for this song premiered on Friday, and can be seen on Dagbladet.no. In other news, the annual Hungarian music awards were held on Wednesday, and a-ha were nominated in the “best modern pop-rock album” category with Foot Of The Mountain, Tamás in Hungary reports. The other nominees were Beyoncé, Lady Gaga, Lily Allen and The Black Eyed Peas. The award went to Lady Gaga for her album The Fame. Last night, Lydverket on NRK1 had a report about Apparatjik’s recent concert in Berlin. The whole video clip can be seen on Lydverket’s website here. “The whole idea of Apparatjik is that we are four professional people who approach the project with the spirit of an amateur. We all make videos, we all make music, we all sing. There is a good intensity and energy that emerges when we are able to get together“, Magne tells Lydverket’s reporter. A third concert in New York has now been announced. a-ha.com has the details about the show, which takes place on 8 May at the Nokia Theatre. This also means that the total number of concerts on the farewell tour has now reached 40.
a-ha will be playing a concert in Zurich, Switzerland on 17 July, as part of the Live at Sunset festival. This according to the festival’s website. The concert will be held at the Dolder Eisbahn – a large outdoor ice-rink. a-ha last visited Zurich in 2002, on the Lifelines tour. The regular ticket sale for the New York and Los Angeles concerts started on Ticketmaster today, and due to “extremely high demand” a second date in L.A. has now been added on 16 May, a-ha.com announced. Pre-sale on a-ha.com now, with Ticketmaster following tomorrow. There is a review of the concert from the Toledo Blade newspaper here, so it definitely happened. I have now updated the 1986-87 tour page with this “new” date. And singer Elisabeth Andreassen has posted a picture on her blog of herself and Morten with British/Norwegian group A1 at the concert for Haiti on January 24th. Magne was interviewed by Janice Forsyth on the BBC Radio Scotland programme “The Radio Café” yesterday. The 14-minute interview, which was mostly about Alpha Beta and Word Symphony, is available for listening on the BBC Radio Scotland website here until next Wednesday (starts after 1 min 30 secs). Apparatjik played their first concert at the WMF Club in Berlin last night, as part of the music and art festival “Club Transmediale”. The concert lasted around 40 minutes, with the band members playing inside a specially constructed cube. “This concert is as much an art performance, as a concert“, Jonas Bjerre told NRK’s Lydverket, which will have a TV-report about the concert next Wednesday. The Berlin concert is the only Apparatjik performance that has been planned. “We would like to continue our collaboration, but if that will result in more music or something completely different, who knows“, the band says. 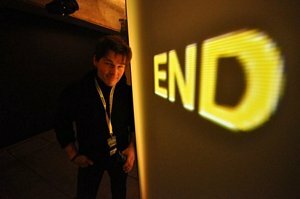 Magne was not the only a-ha member in Berlin last night, as Morten had also come to witness the event. 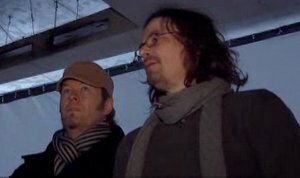 “[This was] refreshing, and even though Magne doesn’t really have time to do this right before our own tour starts, I think this is the best preparation he could have done“, Morten tells Lydverket. The Apparatjik album was also released yesterday. It’s called We Are Here and can now be purchased as an MP3 album or pre-ordered as a CD/DVD set here.